The theme of our first panel was addressing the issues surrounding the underserved communities such as South Asians and Southeast Asians within the larger Asian Pacific American (APA) community. 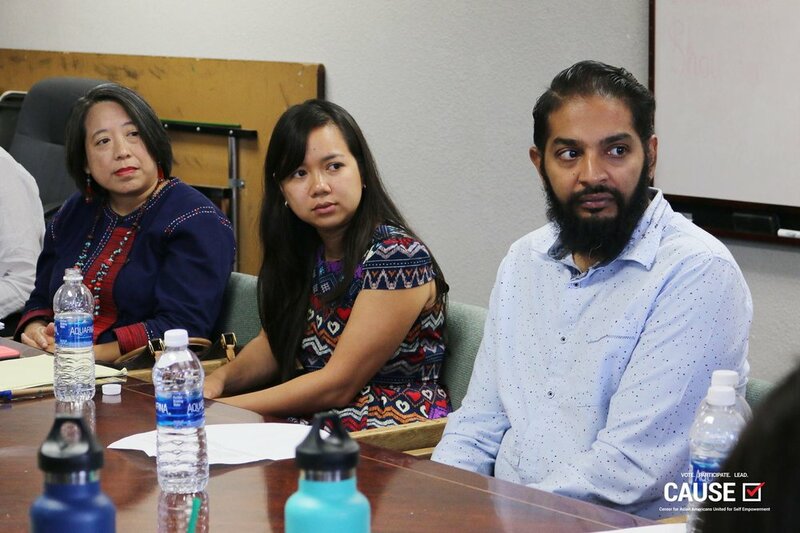 This first panel included Bilal Kazmi, Community Outreach and Volunteer Coordinator of the South Asian Network; Chancee Martorell, Founder and Executive Director of the Thai Community Development Center; and Susanna Sngiem, Executive Director of UCC. A consequence of the model minority myth is that within Western society, oftentimes when people say “Asian,” East Asians are the faces that are pictured. Because of this and a lack of disaggregated data, members of the South Asian and Southeast Asian communities are left out of the conversation when it involves APA issues. The speakers of our morning panel explained to us the intricacies involved in advocating for the underrepresented portions of the APA community. Our speakers shared all of these challenges with us: from the lack of funding, pre-established dialogues, and issues that are left unspoken (such as the exploitation of workers). I particularly enjoyed this panel because they also provided us with concrete examples of how to be better advocates for the APA community by ensuring that we create spaces for the parts of the community who do not have a place at the table yet. Something that particularly struck me was the conversation surrounding mental health and trauma. As a second-generation, Asian American, I have constantly been surrounded by Western medicine my whole life. So, when it came to mental health, it never occurred to me that there were already established coping mechanisms that did not match the Western standard I previously held. I thought this dialogue was incredibly important because when discussing these issues, it cannot solely be through a Western lens, but rather a combination of both the Asian and American sides. We had our leadership luncheon with the Honorable Fiona Ma, Boardmember of the California State Board of Equalization on “Political Leadership.” Boardmember Ma gave us a very candid, realistic view of her journey to her leadership role in politics. She discussed her experiences being an Asian American woman with little experience in politics at first, but also the process in which she learned how to navigate this industry. I particularly resonated with her story of how she was criticized for hiring to women, but instead of backing down answered, “But everyone else hires two men, so what’s the problem?” Being able to hear her stand up for herself as a woman of color is extremely empowering to hear as I begin my own professional career. Lastly, we came back to the CAUSE office for a professional development workshop by CAUSE’s Executive Director, Kim Yamasaki, on “Philanthropy, Stewardship, and being an Ambassador for your Community.” Kim premised that this particular workshop would be our most important one because it would create the mentality that “giving is a habit.” Throughout the workshop, we went over the three pillars that make up CAUSE: knowledge, access, and network. Among the most important portions of this workshop was defining what it means to be an ambassador, whether that is through small acts such as putting CAUSE on our resume/LinkedIn or recommending applicants for the next set of Leadership Academy interns. Lastly, Kim brought us back to the reality that communities and organizations need money to function—even if the donation does not come in large amounts. “The power of the collective is very strong,” Kim told us. One of the reasons I applied to the Leadership Academy in the first place was to be able to give back to my community. Not only is CAUSE a part of my community, but through this program, this organization has given me so much that it is only right for me to do the same. Throughout the Leadership Academy, I have learned that there is more than one way to make a difference. What is important when making that difference, is not only creating our spot at the table for our voices to be heard, but also supporting others who are doing the same by voting, funding, and having meaningful, open dialogues.